If you've seen a Lincoln Zephyr recently and were intrigued, don't try to find one in a dealership. One year after the Zephyr's introduction, this mid-size sedan gets a name job and some changes under the hood. Zephyr is now the 2007 MKZ, consistent with Lincoln's new alpha-numeric model names. The MKZ does show a new direction for Lincoln. A key element in this shift is offering luxury vehicles that are able to engage the driver instead of treating him or her as another occupant who happens to be seated behind the steering wheel. The MKZ succeeds in this respect, managing the difficult trick of delivering a ride that is generally comfortable with handling that makes it interesting and gratifying to drive quickly on a challenging country road. This sedan's advantages include a competitive price and the availability of all-wheel drive (front-wheel drive is standard), which isn't offered on most of the MKZ's competitors. The drawbacks include its lack of electronic stability control or skid-management electronics. Overall, the MKZ is well rounded. It's suitable for day-to-day commuting even on the Midwest's broken streets, comfy for long-distance cruising on an interstate and playful during a quick trip along a two-lane road through the mountains. It has plenty of power, but it uses regular fuel and delivers decent gas mileage. There are indications that quality should be good. The 2006 Zephyr placed second in its segment in the annual Initial Quality Survey conducted by J.D. Power and Associates, just behind the Lexus IS 250/350 and ahead of the Acura TL. This study looks for problems reported in the first 90 days of ownership. The MKZ debuts in one of the most competitive classes in the new car market. It offers a likeable package that's worth a look, particularly if Lincoln dealers are in the mood to negotiate or the automaker offers incentives. Many appreciate its styling, but like many cars it lacks that intangible bit of magic that would make it utterly compelling. The five-passenger Lincoln MKZ is an upscale sibling to the Ford Fusion and Mercury Milan sedans. It's powered by a strong, 263-hp V6 with a six-speed automatic transmission. Front-wheel drive is standard. All-wheel drive is available. Major standard equipment compares favorably with the best cars in this class, which includes the Toyota Avalon, Nissan Maxima, Acura TL and Cadillac CTS. 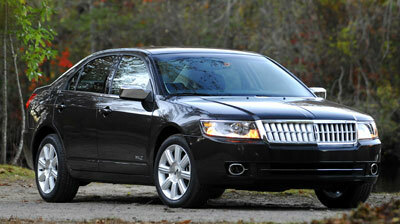 The 2007 Lincoln MKZ comes in one trim level, with either front-wheel drive ($29,235) or all-wheel drive ($31,105). Leather upholstery, dual-zone temperature control, power heated front seats, a six-speaker AM-FM stereo with six-CD changer and redundant controls on the steering wheel, cruise control, power windows and door locks with remote entry and a number pad on the door, 17-inch wheels and a 60/40 split and fold-down rear seat all come standard. Options are relatively few. The most popular are a DVD-based navigation system with Lincoln's high-power THX II audio system ($2,400) and a power moonroof ($1,200). The remaining options: ventilated front seats ($495); high-intensity discharge headlights ($495); satellite radio ($195); aluminum interior trim ($195); 17-inch chrome wheels ($895). Safety features that come standard: side-impact air bags for chest protection in front; curtain-style head protection airbags for all outboard positions; traction control and antilock brakes with electronic brake-force distribution (EBD), which distributes braking force to the tires with the most grip. The MKZ achieves Acceptable ratings in heavy frontal and side-impact crash tests conducted by the Insurance Institute for Highway Safety, on a scale that includes Good, Acceptable, Marginal, and Poor. Some of the MKZ's major competitors have Good ratings in these tests. The MKZ lacks one safety feature offered on most competitors and many cars that cost less: electronic stability control. Studies suggest that these skid-management systems are effective in reducing single-car accidents. The Lincoln MKZ is styled in conservative fashion, creating a prim, proper effect. The one exception is a big, chrome grille, which Lincoln is using across its line in an effort to instill brand identity. The MKZ has scored well in initial quality surveys, but we found some variance in vehicles we tested. One had prominently wide seams between hood and fenders. The doors slam with a resounding thud. Some will see this positive sound as a sign of quality, but the downside is that the doors require quite a bit of force to seal snugly. Over 400 hundred miles of interstate and two-lane travel, we found the Lincoln MKZ driver's seat to be comfortable for two or three hours at a time. The interior is generally a pleasant, convenient and reasonably quiet venue, if a bit less serene that a couple of other cars in this class. As one expects for the money, the interior looks more upscale than that in the Ford Fusion and Mercury Milan, which share the MKZ's underpinnings and some major mechanical components. The trim plastics look best in lighter colors. All in all, the MKZ interior doesn't come across as shameless luxury as much as comfortable well-to-do, which is pretty much the standard for this class. The controls for heating, cooling and the stereo are all easy to find and use. Storage is adequate. The optional navigation system works well. The video screen is smaller than many, but it's easy to figure out without excessive reliance on the owner's manual. And unlike some nav systems, it had information about some obscure dirt roads in Michigan, where much of our driving took place. All automakers make choices about where to spend and where to save, and many choose not include such detail in the navigation software. That means that just when you need help the most, the navigation system breaks your heart and announces something along the lines of: “You are leaving the mapped area. Turn-by-turn guidance is no longer available.” Not so in the MKZ. As with most sedans advertised as five-passenger, the reality is that the MKZ will accommodate four six-footers in reasonable comfort. Five is a crowd unless you are toting small children, and comfort for four assumes that front-seat passengers aren't too piggy about their legroom. Trunk capacity is rated at 15.8 cubic feet, which is more than many cars in this class. The trunk lid swings high for easy access, and the fold-down rear seat allows some flexibility for hauling more. Forward and over-the-shoulder visibility is acceptable. But the high rear deck intended to increase trunk space also limits visibility immediately behind the MKZ when backing up. The 2007 Lincoln MKZ features a new, more powerful engine, and it's a welcome improvement over the engine used in the Zephyr. Horsepower from the new Duratec 35 increases 20 percent to 263 hp, compared to the Duratec 30 it replaces, and it puts the MKZ on much better footing with the Nissan Maxima and Infiniti G35. Moreover, the new engine delivers full power on regular 87 octane gas, and it comes with only a one-mpg decrease in EPA mileage ratings (19 city, 27 highway with front-wheel drive). The larger engine, working with the efficiency of a six-speed automatic transmission, means great acceleration in the instances most drivers need it. It doesn't turn the 3,540-pound, all-wheel-drive MKZ (about 130 pounds more than the front-wheel-drive model) into a rocket, but acceleration is more than acceptable for any reasonable task, including a quick merge onto a busy interstate, and it's satisfying just to feel the rush of power. The Duratec 35 is also fairly quiet and smooth. The disappointment is that the six-speed automatic cannot be shifted manually, a fun and helpful feature driving on a twisty road or in the mountains. Moreover, Lincoln could improve the control program to improve response at lower speeds. From a dead stop, or traveling at 50 mph, the transmission works great. Slam the accelerator as you pull out to pass and the transmission will kick down nicely, one or two gears, to put the engine in the high-torque part of its power band. At 10 mph, it's a different story. Creeping out of a parking lot, for example, the transmission will shift up a gear or two, apparently to save fuel. But when the driver approaches the street and hits the gas for a hole in traffic, the transmission doesn't want to kick back down to first gear. The MKZ bogs a bit, and the anticipated acceleration isn't there, which is annoying. When Lincoln turned its 2006 Zephyr into the 2007 MKZ, one key objective was tightening up the suspension to make the car feel less floaty. We like the results. On a rough surface the MKZ does a reasonably good job of shielding its occupants from broken pavement and poorly repaired potholes. But the engineers were clever enough to combine that ride with handling that is both reassuring and satisfying. Despite having much of its weight up front, the all-wheel-drive model we tested was reasonably quick to change direction and head into a turn, lacking the stubborn, nose-heavy feeling of some all-wheel-drive vehicles. The MKZ's steering has a bit more weight than the Zephyr's did, creating a more positive, satisfying response. Yet it doesn't feel heavy when either pulling into a parking spot or cruising at 65 mph. And there's no loose, sloppy feeling when the MKZ is pointed straight ahead. Turn the wheel just a little bit and it begins to respond immediately, with no dead spot. The steering will please 95 percent of all drivers, in our estimation. The others are serious driving enthusiasts who are likely to want a little more weight and a slightly better sense of the car connecting with the driver. The brake pedal has a nice, progressive feel, and the brakes deliver more stopping power than the typical driver will ever use short of an emergency situation. Those in snowy climates will appreciate the fact that MKZ is available with all-wheel drive, a feature that's hard to come by in this price range. Some consider AWD a safety feature; at the very least, it can be a huge help in getting up a slick hill. Like many all-wheel-drive systems, the MKZ's normally operates as front-wheel drive, and sends power to the rear wheels if the front tires begin to lose grip. We didn't have the chance to try it on snow, but on loose gravel it worked as advertised when accelerating hard from a stop. The new name, extra power and a makeover is not enough to put the Lincoln MKZ at the top of its segment, but it becomes a much stronger contender. While it lacks electronic stability control, which many consider an essential safety feature, the MKZ is a likeable mid-size sedan. Loaded and equipped with all-wheel drive for about $35,000 (before any incentives), it's worth a test drive. Chris Jensen filed this report to NewCarTestDrive.com from New Hampshire. Safety equipment (standard): dual-stage front air bags; front-passenger side-impact air bags; full-cabin side-curtain airbags; anti-lock brakes (ABS) with electronic brake-force distribution. Head/hip/leg room, f: 38.7/54.0/42.3 in. Head/hip/leg room, r: 37.8/53.6/37 in. Cargo volume: 15.8 cu. ft.